Extra functionality, faster testing, and as rugged as ever. The new 1650B Series builds on the rugged reputation of the earlier 1650 Series, only it’s re-designed to meet your need for more productive test tools. This is the instrument that can be used every single day (day in, day out), and covers all the basic needs. 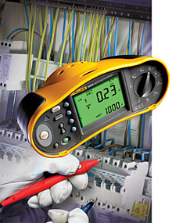 It is the preferred tester for every front-line electrician/installer. This is the instrument that is indeed ideal for professional users due to its additional functionality. It is also ideal since even though it has high-end features, it is still easy to use – even after longer periods of non-use; because operating it is intuitive and not forgotten easily. This is the instrument that has it all, in a word: it’s complete. From all the test functions you need to in-built memory for documenting results. This makes it the complete solution for professionals, especially contractors, everyone who would want to have the best tool available and always understands (or know) how to use.